September 28 is Read a Child a Book You Like Day! 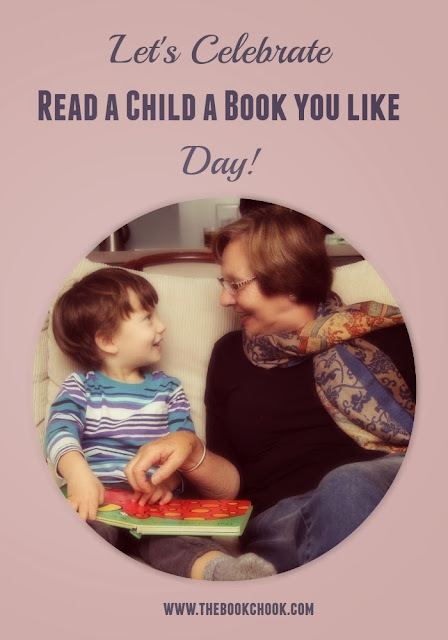 Although I’m a staunch advocate of encouraging children to choose their own reading material, I love the idea of this special book-related day. Why? Parents who loved a special book will just naturally want to share it with their kids. They’ll bring lots of passion, enthusiasm and even nostalgia to sharing it. When children know it’s a day designated for reading a book you like to them, they’ll be intrigued. In school, other adults could be invited to share a book they like(d) with kids too - teachers, parents, grandparents, principals, celebrities, heroes, authors, illustrators, even politicians. Maybe adults could remember to enquire about what books the children like, so that it’s one gigantic book fest. Children could record the sharing with video so that it can be re-played. Photographs of guests and books could be displayed so young borrowers have the chance to discover these books for themselves. I love the idea of any special day that brings both adults and kids together as readers! Let’s celebrate reading with our kids not just today, but at any and every opportunity. If you’d like to find some other special book-related days to focus on, browse my List of Book-Related Special Days for Kids. If you’re looking for great books for kids, check out my Book Reviews in the right sidebar. We did this!! It was Inspector Dewey! Fun book, we went through it several times, what a great afternoon it was! inspectordewey.com, author Kristen Heimerl. It's a good read regardless, but was a fun read with the kiddos!